They are rechargeable, though the batteries on half of them have died (I don’t know how old these are and suspect they were stored without being charged). They can still be lit with the AC adapter. Currently they run a about $120 each. The optics, for this price range, are excellent as is the general build quality. The base, turret, stage, and eyepiece tube are all metal. The intensity of the white LED can be varied. There is only a coarse focus, which is fine (pun) for this level of use. The objective lenses are parafocal, or very nearly so. The stage is translationally fixed. It’s very nice for the money. The real point of this lesson is to introduce the students to making careful observations. We talked about parts of the microscope and went over how we would use them, before passing them out. We also talked about how we would take turns, a serious concern with only 4 scopes and 20 students. I then explained magnification and gave some examples. There was often trouble in trying to focus, sometimes the turret would be set between lenses, sometimes the light wasn’t on, sometimes the student would say that theirs was in focus but upon checking there would be nothing but a blur. Odd that they were just as excited with the blur, I’m sure this should tell me something. The rest of the class was spent looking and sketching, with Ms. Haynes and myself running around helping and settling disputes about whose turn it was. Specimens: I brought pond water, getting lots of really dirty gunk, baker’s yeast that I had started that morning (a tiny amount of dry yeast, a pinch of sugar, in about 1 oz of water), a flower, a leaf, a bug found on the front of my car, and a collection of bought prepared slides. The prepared slides, the yeast, and the bug were great. The pond water took too much care for 3rd grade. Sketching went great too. We were sure to label them with basic data; specimen, date, observer’s name, etc. Trying to label the magnification used was too much. Also, it was carefully explained that they should draw exactly what they see. I wish I had removed the highest power objective lens from each scope. We avoided crashing into slides pretty well, but the additional, difficult to focus (for them) lens was distracting. With a 10x eyepiece having just a 4x and a 10x objective would have been plenty. The scope did come with a usb camera eyepiece, but I really wanted the students to have ‘real’ experience, rather than something semi-virtual. The camera, as is expected, is basic; 640×480, high noise. The refresh rate isn’t too bad, focusing is tolerable. I don’t know what magnification is on the camera-piece. I had some issues with the included software and usedMicam instead. 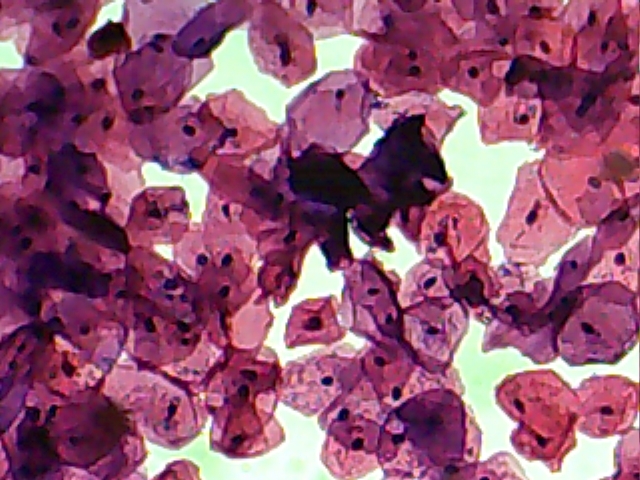 Here is a sample of a “mouth smear” prepared slide using the 10x objective: Again, it ain’t research grade, but it’s pretty amazing for the money. 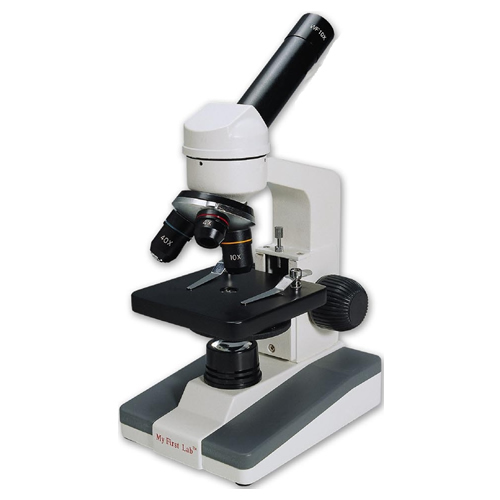 I have wondered if a cheap ‘pocket microscope’ would be better at this grade level. I have bought a couple of all plastic (including the lenese) 60-100x scopes that cost around 7 dollars (yes, seven) and believe they would be ok. A slightly better scope of the same ‘pocket’ design but with glass lenses would be great. For fourth graders it would probably depend on the class, but by 5th grade the microscope we used would be the way to go. Of course if you are helping just 1 or 2 students then it would be good for any grade.